The Thursday Walkers embody the spirit of community. Perusing Market Charm panel #46 on the new MarketFront you will discover the names of nearly 50 women, from different backgrounds, different parts of the country, and different occupations. And right, smack-dab in the middle of the panel is the Charm that sums it all up: Best Friends Forever. 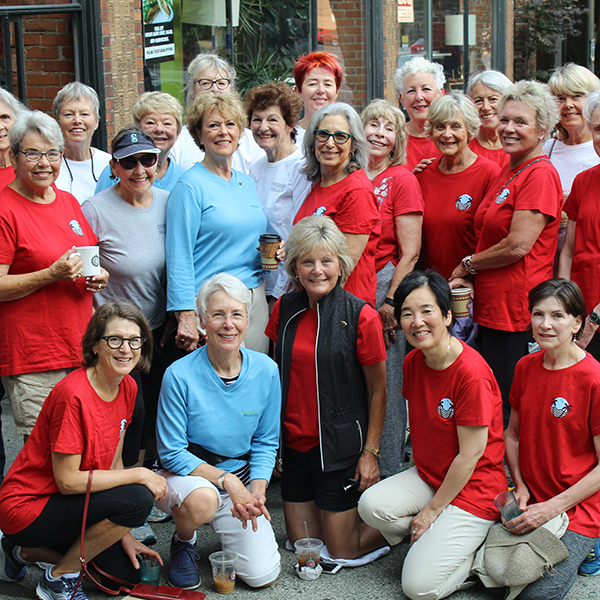 Founded by Helen Strusser in 2003 The Thursday Walkers are a group of energetic, fun-loving women whose walks have inspired great conversations, lasting friendships and together they have given back to our Market Community over and over again. Helen started the group at a time in her own life when walking was a remedy – a way to move and to heal. She and the other five original walkers graciously brought many more women into their fold. Many other Walkers shared the ways in which the group has changed their own lives. Carol got linked into the group after moving to Seattle from Florida. She knew no one in her new city but somehow the Walkers found her and just like that, she had an indomitable group of friends to support her and help her adjust. Lynne Shira found the group right after she retired. For her going from very busy to very idle left her hurting, but the Walkers were there to give her purpose and help her transition. Now the Walkers are an ever fluctuating tumbleweed, gladly inviting anyone who needs them into their mix. 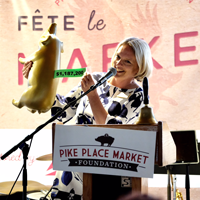 Part of what makes them such a strong and abiding bunch is their commitment to shared ideals: philanthropy and a love for Pike Place Market. Many of the Thursday Walkers live in downtown Seattle, making Pike Place their backyard and with such close ties they have perfected the art of giving back. Over the years they have taken on their own fundraising projects for The Market Foundation like the 2011 Men of the Market calendar, which raised $35,000 to support the Market’s community services. And, when we launched the Pike Up! campaign in 2014 they were some of the first to jump on board. Together they donated for an entire panel of Market Charms to commemorate their walks together and many of donated for family Charms and Hoofprints as well. They have worked hard to make sure that at least a couple of Walkers act as board members on the The Market Foundation board, putting in the behind the scenes work that a board seat requires. 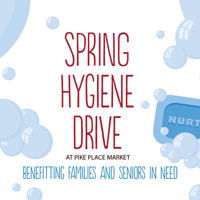 Every year they support our events such as Sunset Supper and create personal connections with the social services by volunteering at the Pike Market Food Bank or donating their Mahjong winnings to the Preschool. They put their heart and soul into everything that they do. Thank you Thursday Walkers! You are an unstoppable force of good – our growing, caring community wouldn’t be what it is today without you.